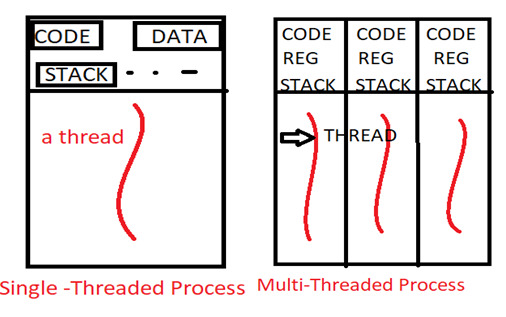 In this article, we will learn about Threads in operating system, and Benefits of multithread programming. Multithread models are also prescribed in this article. Traditionally if a process has a single thread of control then it is termed as a single threaded process. If a process has multiple threads of control then it is termed as a Multithreaded process. It can be used to perform multiple tasks at a single time. Thread also plays a vital role in RPC which means Remote procedure call. It is used to call a function of some another program. The thread can also be used for the interprocess communication. Since multithreading is an application which will allow a program to run even when a part of it is blocked. So it will increase the responsiveness to the particular user. For example suppose that a particular section is not responding in the above Multi-Threaded diagram instead of an entire process not responding, the two sections can respond to the user, which means Responsiveness. It is a beneficial part in case of Multi-Threaded programming as it allows an application to have several different threads of venture within the same address space. Number of jobs completed per unit time is increased which is a favorable condition. As different threads have the same address space so it is very easier to communicate with the Multiple-Thread. As we know that threads share resources of the process for which they belong, by this it will be more economical to create threads for data and resource sharing. The benefits of Multi-Threading can be increased in an architecture which means threads can be made to run in parallel on a different processor, thus there will increment in a concurrency level. In this mapping is done between the many user-level threads to the one kernel thread. So in this, we have many user levels which are mapped with one kernel thread. 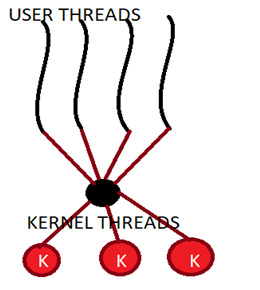 In this mapping is done between each user thread and the kernel thread. 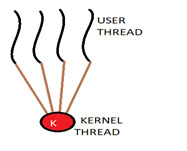 It is a type of model in which it multiplexes many user-level threads to a smaller or equal number of kernel threads. 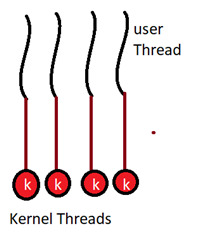 In this, if we have four user threads than we can have either four or less than four kernel thread.